And then – came in a e-mail from Judit! Judit Alguero introduced herself as a journalist with expertise in humanitarian communications and international justice. She wrote to me about the III Anantapur International Relay Ultramarathon, which took place between the 23rd and 24th of January, 2018. A charity run that aimed at raising funds to build 36 houses for poor families, water tanks, roads and electrification in the village of Yerragunta in the Anantapur district (Andhra Pradesh). She asked me if I would like to spread the word about this run so that they could have more registrations (and more funds) next year! What got me ready to do this blog was that the NGO – Rural Development Trust (RDT) had managed to get 10 girls of the nearby villages running too. I found it very exciting and numbing at the same, that a village that does not have a roof, and lacks basic infrastructure – had 10 girls ready to brave a Relay Ultramarathon! Wow and a big BOW! A group of 76 runners (24 Indians and 52 Spanish) followed a 170km long route through villages covered under the Rural Development Trust (RDT) integral development programme. The tracks passed through Kollakunta, Mavaturu, Penukonda, Gondipalli, Kona, Chinnampeta, Kalikivandlapalli, Mamillapalli, M Bandamedapalli, Bukkacherla, Kakkalapalle, RDT High School for the Hearing Impaired in Bukkaraya Samudram, RDT main office in Anantapur, Kandukuru, Zangalapalle, Chintalapalli Temple and will finish at RDT Hospital in Bathalapalli. Organised in groups of four, each person ran 40km in relays of 10. Once runners passed on the baton to their team members, they rested at their assigned transition point. The initiative, supported by RDT*, was originally launched by Spanish ultramarathon runner Juan Manuel Viera, who ran 150km solo in 2016. His enthusiasm motivated more than 40 athletes to run along with him in its second edition in 2017. This year, the event had the participation of 10 local women as well as differently abled athletes. 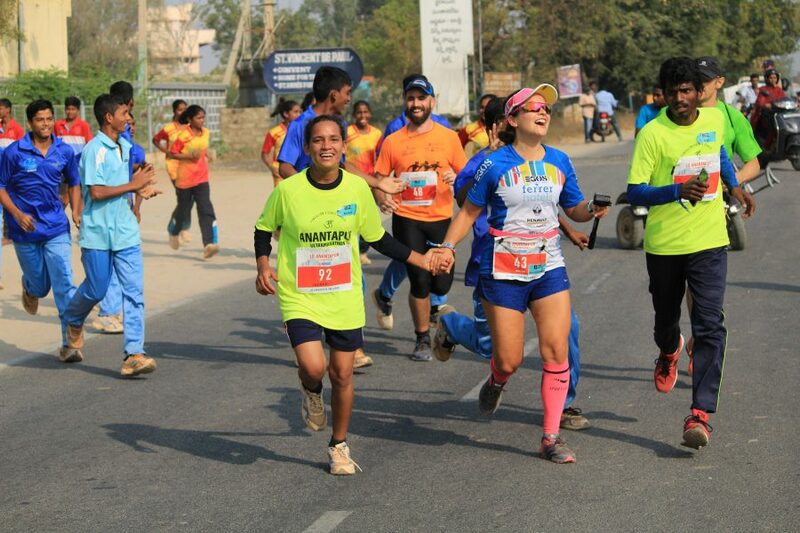 The ultramarathon was preceded by the Community Running Day, which took place at the Anantapur Sports Village on 21 January and was open to the general public. More than 100 girls and boys enrolled in RDT schools and projects also took part in it. Rural Development Trust (RDT) successfully raised Rs. 1 Crore. They are now in the thick of setting up the plan to start building homes and getting the water tanks in the village! RDT is a non-governmental organisation committed to the progress of vulnerable and disadvantaged communities in the states of Andhra Pradesh and Telangana, in Southern India. Since its inception in 1969, the organisation has endeavoured to improve the quality of life of the rural poor, with a particular emphasis on women, children and people with disabilities. It has progressively implemented comprehensive development programmes involving all areas of development.